The SMCGS1610/SMCGS2410 are the first available unmanaged switches that can be transformed into smart switches with the use of a single button. DHCP Prevention protects the company’s valid DHCP server from any rogue DHCP servers in the network. When you push the Smart button to enable the DHCP Prevention feature, only the DHCP Port can connect to the valid DHCP server. When a loop occurs, the switch blocks the loop port automatically, protecting the switch and indicating the port that has the loop issue with the port LED. The switch detects some DoS attacks and provides protection. The switches support IGMP snooping v1/v2 to enable smooth video streaming. The switches support the IEEE 802.3az Energy-Efficient Ethernet (EEE) feature to save power consumption. The switches support a fan-less design, providing a silent operating environment. When the switches receive a frame tagged with an 802.1p priority, they place it into the appropriate priority output queue. Priority queuing is needed in implementations where time-sensitive data, such as voice and video, are streamed across the network. transformed into smart switches with the use of a single button. DHCP prevention combined with loopback detection and prevention, improves the network environment and reduces network maintenance costs. The switches also provide DoS attack protection, minimizing virus attacks and increasing network uptime. 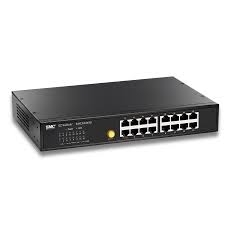 These switches provide Gigabit Ethernet connectivity from the network backbone all the way to the edge and to individual desktops. With up to 10 times the speed of 100 Mbps networks, these switches reduce transfer times of large data files and boost bandwidth-intensive applications, thereby significantly enhancing overall network performance. Jumbo frame support enables more efficient data transfers with data packets up to 9K Bytes in size. The switches are easy to install and an ideal solution for network migration with their 10/100/1000 Mbps Auto MDI/MDIX ports. Not only are ports triple-speed, all ports can be either connected to a workstation or another switch, without the need for crossover cables. Supporting non-blocking wire-speed throughput, the switches are built to handle the growing performance needs of bandwidth-hungry applications in today's networks.